There’s something so fulfilling about getting the laundry completely put away and cleaned. What’s less than pleasant is pulling your favorite top out of drawer only to discover a musty smell. Use a simple Dresser Drawer No Sew Sachet to keep your clothes smelling fresh and clean. Not only are these sachets easy to make (no expert crafting required), but they use the rich mint aroma with crisp eucalyptus tones of Balm Mint Bush essential oil to keep your clothes fresh and must-free. Fold your fabric to make a 6×6 in. square. Cut hem tape for two sides. Lay hem tape on the edges of the patterned side of the fabric. Iron each side with tape for about 30 seconds. Allow drying for about 30 seconds. In a bowl, mix Epsom salt, rice, and essential oil. Fill sachet with the desired amount of mixture. Place in a dresser drawer for a refreshing, crisp minty aroma. My tennis shoes are FINALLY going to smell good! is there another oil that would work well for this? Honestly, this DIY would work well with just about any oil! Feel free to try it with one of your favorites or use mint, citrus, pine or floral oils. I made some of these Dresser Drawer No Sew Sachets. I use my own essential oil faves to make. I have made them for friends as well and they love them! This will be such a fun project to try with my niece. Never too early to get them interested in DIY oil projects 😉 Thank you so much for this. This is such cute idea! Thanks for providing the info! I just made these and I’m so happy to have a nice Scent in my musty closets! I made two with balm mint bush and one with sniffle stopper blend. I am excited to make some for the car too! I love this one. With some cute/fancy fabrics this would make nice little gifts or party favors! I want to try this DIY. After watching the video, I know I can do it. Looking forward to our clothes smelling fresher. I love making these … in many different scents. And I didn’t have to drag out sewing machine!!! Awesome! I have an old piece of furniture that has that “musty” smell to it, I’m definitely going to be making some of these! Would any favorite oil scent work in place of Balm Mint or is there a specific reason for choosing that one? I don’t have that oil but have some other mints (peppermint, spearmint) if it needs to be in that family. This is a great idea. I wonder how well the small to medium empty cotton drawstring pouches would work also. I may give that a try since I have those on hand but no extra fabrics. Thanks PT for always giving great ideas! This is great…I know just what drawer needs this! I made one of these last week using a cloth bag I already had and I love it! I bought Balm Mint Bush recently and had been looking for a reason to use it, this is perfect in my undies drawer. I’m gonna make these for our cars! How long do you think the scent will last or does it depend on the temperature? I do not care for lavender the scent of lavender, so lavender sachets have never appealed to me. Can’t wait to try this with the Balm Mint Bush. Thanks for sharing! May i know how often shld i be replacing the sachet? Or i can just keep refreshing it? Also.. so u think old socks and a string tied at the open end would work too? You’ll notice when the scent begins to fade and you can refill it as you’d like 🙂 You are more than welcome to try your sock, too, and let us know how it turns out! With Spring Cleaning right around the corner, I’ll be making these to add to closets and drawers…and even one for under the seat of each or our cars! I want to try making this for my drawers. How long does the scent last though? How often should you refresh the scent? This is great! I love to restore old furniture and sometimes the furniture can have some lingering odors just from age. These sachets should help a lot! I also use rice heating pads, can I add a few drops of oilvto these? What oils/synergies do you recommend? I want to try this! How often does it need to be changed? Could this be used in the dryer to help fragrance the clothes and house while drying? (Maybe only using rice … ) Thanks! 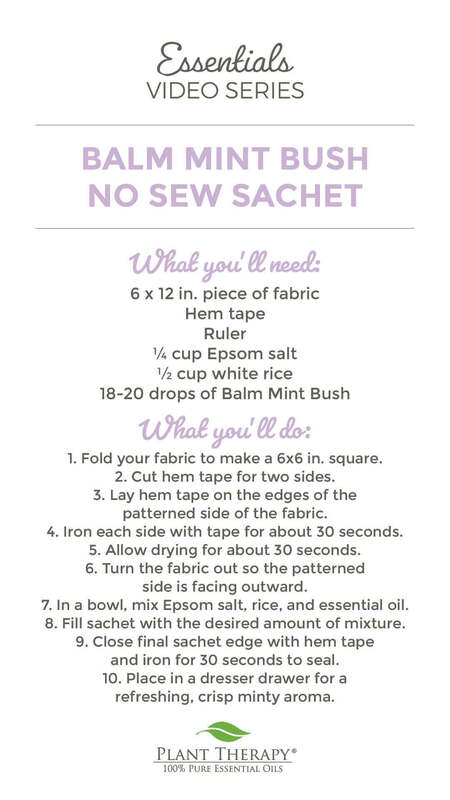 We wouldn’t recommend using this in a dryer as it is made really just to sit in a nice spot 🙂 I can’t guarantee the hem tape will hold the sachet together when it is getting tossed and turned in the dryer and there is potential for a huge rice mess! Awesome idea! Definitely gonna try this out. Love the idea totally. Sounds like an aweseawesome idea !! I love this idea I’m definitely going to try with an empty sachet bag. Are there other fragrances that you recommend? Clear instructions and good option for no-sew. My kids love your craft ideas! Thanks! Is there any concerns for oxidized oils after using and refreshing the sachets for a while? Is that even a concern in passive diffusion? I was wondering why the epsom salt…absorption of oils? Thanks! I can’t wait to make this!!! I am going to make mini ones for my husbands shoes and one for the car! That was my thought was cars and shoes. Have you made yours yet? Love this idea! I will definitely be giving it a try! Such a cute idea! I can’t wait for my oil to arrive now all I need to do is get hem tape! About how long does the fragrance last? Just wondering, how do you “refill” the sachet when it looses its fragrance? Veru neat! Will definitely try this! What a great idea! I have a few empty sachet bags laying around and I think I may make a few of these! Thanks! I love this DIY, I’m definitely heading to a local craft store for some hem tape and giving this a go! I love this idea! Can’t wait to make some. One more project for these cold days keeping us inside. I can’t wait to try this! I remember my Mom and Grandmother having sachets in their dressers when I was young, but haven’t thought of that in years. I am going to make some this weekend! I love this idea. This is great idea for those of us that don’t sew. Is any fabric type better than another and how long do they last? I would think you could make up a few of these and also use them in your linen closet. Honestly, the fabrics used in this video are just scrap pieces we found laying around, so I feel like it’s safe to say that most, if not all, fabric would be great for this. More than the fabric, buying quality hem tape should be the priority here and ironing it really good so it sticks. The aroma in these satchets should last at least a few weeks, but you’ll notice when the scent begins to fade. You can carefully cut the top off, replace the oil as needed, then use the hem tape and iron it closed again. I hope this helps!